On June 20th, 2011, our sweet baby boy, Jayden, turned 3. It's hard to believe that time has flown by so quickly since this beautiful spirit joined our family. We had just relocated to Utah in the weeks prior to his birthday, and we hardly knew anyone. We were living in a tiny little condo and it was hardly the place to throw a party- so as usual, we headed to Grandma's in Idaho :) At the time of our move to Utah, Mason was the end of orthodontic treatment. It had been paid for in full and in order to complete his treatment, we had to come back to Idaho once a month until he got his braces off. So it worked out well to plan his appointment close to Jayden's birthday so that we could celebrate in Idaho with our family. 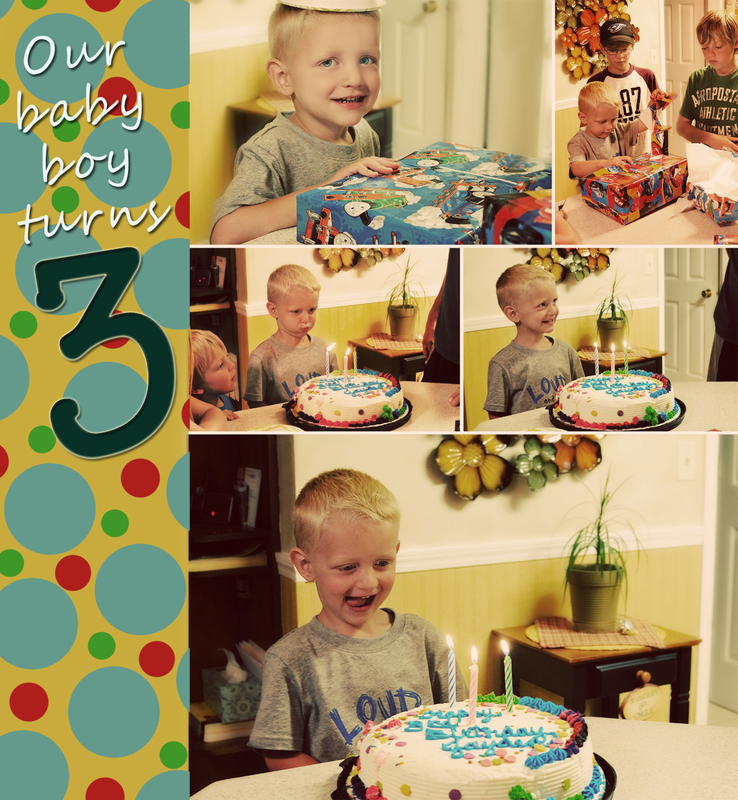 We had a little get together at Grandma Miller's, where we had cake and ice cream and Jayden opened his presents. He got a plethora of Lightning McQueen and Thomas the train stuff. In usual Jayden fashion, he had his big, shy grin on his face the entire time. To celebrate Jayden, I want to talk about his sweet personality a little: Jayden is the baby of our family in every way. He is adored by all of us. He is shy and quiet and loves to snuggle more than any of the other kids. While Jaxon is fiercely independent and doesnt want anything done for him, Jayden wants his hand held through every task- not because he isnt capable, but because he wants someone loving him and caring for him every second of the day. And everyone in this family is happy to do that for our sweet boy. Jayden has the most captivating smile. When someone he doesnt know talks to him, he gets that shy grin on his face, you see his darling dimples and he runs and hides, usually behind my legs. He lets Jaxon do most of the talking for him to people he doesn't know well. Jayden loves trains, Cars, wrestling with Daddy and snuggle time. If you ask him who he loves, he will tell you MASON every time. He worships Mason and cries sometimes when Mason goes to school. He waits anxiously for Mason to get home from school so they can play. At night, he would prefer to sleep with Mason than anyone else. Not a day goes by that I am not thankful that we were blessed with this sweet little boy. He has been an angel in our family. I look forward to each and every day we get to share with him. Jayden, we love you baby boy!! So fun to catch up with everything that has been going on with your family. Sounds like you are really enjoying UT. we are planning a trip back to Idaho this chiming summer and should be in the area. Perhaps we could get together for lunch. Happy Nre Year!